Much has been made about the female-fronted hard rock band. It’s challenging to flip past reviews and YouTube clips without discovering an accumulation of “she’s hot” or “I’d bang her” commentary from the residue of society. It seems the idea of a woman daring to sing in front of rough-edged guitars is still a novelty, I suppose, and so it is the case with Autumn. The Dutch rock band traffics in hard rock with gobs of beautiful harmony. Led by vocalist Marjan Welman, Autumn ventures into its fifth studio album by broadening its borders and deepening its sound. As the follow-up to Altitude, Cold Comfort was born out of tales and experiences from the road. Recording was done using a large collection of vintage amps and equipment, along with Autumn’s road-tested gear, and the purity of sound is unmistakably retro. It’s a throwback to the days of sprawling, swanky records with venturesome and genre-breaking as virtues worth exploring. "In terms of sound we realized there were still leaps to be taken out of our comfort zone and into unthought-of possibilities. As a first step in the right direction, our main focus was on a more open, transparent sound, one through which the often multi-layered nature of our songs would be optimally channeled,” says guitarist Jens van der Valk. Lyrically, the record takes a decidedly chilly look at things. Welman’s vocals, lovely as they are against the wall of Autumn’s sound, reflect a sort of melancholy that seems to expand as she draws away. She blends well with the backing vocals of van der Valk and guitarist Mats van der Valk, but the harmonies are never schmaltzy or overly warm. “More ultraviolent fire on my retina,” Welman sings to begin “Black Stars in a Blue Sky.” The song, which describes “the anti-light,” is a stirring piece that features coarse guitar alongside electronic effects and clever lyrics that carry on the Cold Comfort theme. There are straightforward rockers (“Retrospect”), sleek synth-kissed pieces (“Naeon”) and gorgeous folk-rock numbers (“Alloy”) to be found on Cold Comfort. 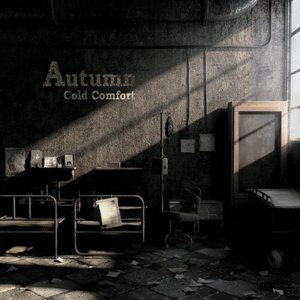 At the same time, Autumn can take Cold Comfort in the fact that their sound is their own. Their creativity doesn’t depend on the impotent impulses of infantile, superficial chumps. This is a good record and Autumn is a good band. Their examination of sound is worth listening to, “chick singer” happily included.